My research program focuses on understanding the diversity associated with communication systems, with much of my current concentration on intra-specific communication relating to reproductive behavior. Understanding the evolution of animal signals is not a trivial task, as it requires detailed knowledge of not only the animals producing the signals (the signalers), but also of the environment through which the signals must travel and of the animals receiving the signals (the receivers). Acquiring the necessary details pertaining to the various steps in the communication process relies upon numerous techniques and approaches and requires integration of information across multiple levels of analysis. As such, my research is very integrative, spanning both ultimate and proximate factors influencing ultimate signal form. For example, my research incorporates field-based studies that examine selection pressures under natural conditions; laboratory-based behavioral assays in which I experimentally manipulate signalers, the signaling environment, and/or receivers to assess signal function; the use of genetic markers to examine population structure with respect to secondary sexual traits; phylogenetic methods and approaches to examine evolutionary trends in complex signal form and function; assays of ecdysteroids and biogenic amines to examine the relationships between circulating levels of neuromodulators and behavioral expression; and the use of neural techniques such as electrophysiology to examine the peripheral sensory system capabilities of receivers. 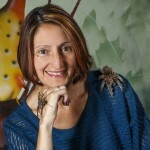 Research in my laboratory uses various arachnid groups to ask questions relating to the evolution and function of animal signals. I have worked mostly with wolf spiders and jumping spiders (Order Araneae), but have also focused on opilionids (Order Opiliones), amblypygids (Order Amblypygi), and solpugids (Order Solipugae).